For Related Professionals: Behaviorism 101 - I Love ABA! Many times when I am working with a family their child is involved in multiple therapies. I would actually be quite surprised to have a client who receives ABA therapy, and nothing else. These other therapies can include speech therapy, occupational therapy, social skills playgroups, hippo-therapy, physical therapy, and many, many more. Not to mention the multiple teachers and paraprofessionals at school the child comes into contact with. Sometimes I get the opportunity to meet and connect with the various professionals and sometimes I do not. When I do get the chance I always am grateful for it. 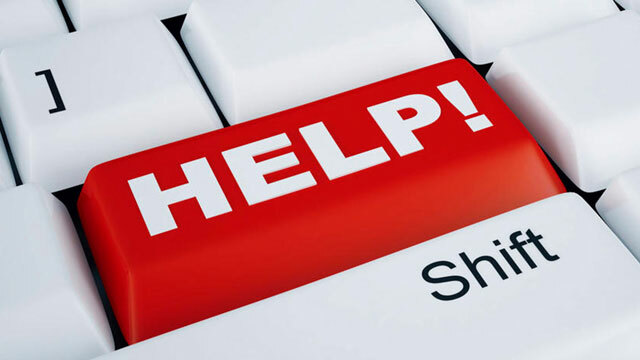 It is always beneficial to talk to other professionals who work with your client. When I meet with these professionals they usually ask me questions about behavior: How do I get the child to sit and attend during teaching trials? How often should I reinforce behaviors? Is the child this aggressive at home? Does the child respond to one-step directions with you? 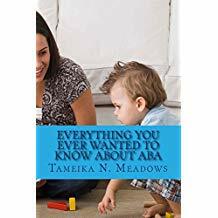 If you work with a child with Autism as a therapist, teacher, nanny, baby sitter, etc, I hope you find this post helpful. These are simple tips to know and be aware of so you can understand behavior management. 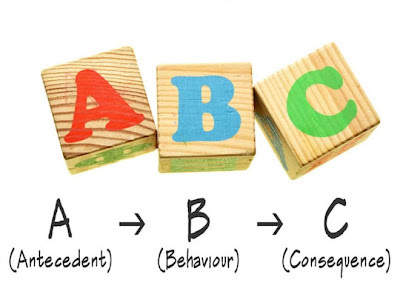 Understand the ABC's of behavior. 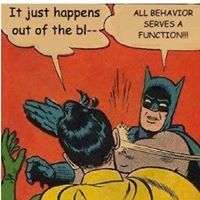 This is your "detective tool kit" to methodically locate the function of any behavior. A=antecedent, B=behavior, and C=consequence. 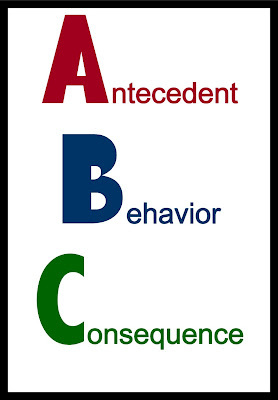 The antecedent means "what happened before the behavior", and the consequence means "what happened after the behavior". For example, if every time you arrive at the house to begin a session (antecedent), the child begins to cry and run away from you (behavior), and you then spend several minutes chasing the child through the house to have them begin working (consequence), then it is very likely the function of the behavior is escape from demand. To correct the behavior, you would find a new behavior that serves the same purpose. Such as teaching the child to communicate that they need a short break before beginning work. Learn what incompatible behaviors are, and use them. An incompatible behavior is simply a behavior that the child cannot do at the same time as the target behavior. For example, if you are working with a child at a table and the child knocks the materials onto the floor a simple incompatible behavior is to have the child place their hands in their lap when you are putting out stimuli. If their hands are busy they have no opportunity to knock things onto the floor. Consistency! Being inconsistent in your reactions to the child's behaviors is equivalent to intermittent reinforcement. By "sometimes" being firm, and "sometimes" letting things go, you are intermittently reinforcing the behavior which will cause it to increase. Decide what behaviors are unacceptable and have the same reaction every single time. Understand reinforcement. Reinforcement is a way to increase behaviors you want to see again. If the child does something appropriate, give them a smile, hug, high five, tickle, etc. Reinforcement is a powerful way to shape behavior and also has the added benefit of making the child more interested in spending time with you. Over time you will become reinforcing to the child because in the past you have delivered reinforcement. Always finish out a demand. Do not give any demand to the child that you are not prepared to prompt if necessary. If the child is across the room playing don't call out to them "Come sit down" unless you are willing to go and get them if they do not comply. A mistake I see often is a therapist arrives at a child's home and the child is tired or in a bad mood. The therapist then says to the parent "He/she doesn't want to work today, so I'm going to leave because the session would just be a bust". The next time that therapist shows up at the house, the child will just repeat the behavior to get them to leave again. Don't back down from demands or let a child escape from a demand. Fill the child's time with activities. Children with significant Developmental Delays need active engagement and teaching throughout the day to remediate global deficits. In a typical session, multiple skills are covered at a brisk pace. Therapy isn't playtime; we have a lot to do. Keeping the child busy and engaged doesn't leave much time for exhibiting problem behaviors.